Article first published as Blu-ray Review: The Great Dictator - The Criterion Collection on Blogcritics. Charlie Chaplin took his time coming around to the world of talking pictures, not directing his first all-talkie until almost a decade-and-a-half after the era began. But with that film, 1940’s The Great Dictator, Chaplin sure had something to say. A direct attack on the person of Adolf Hitler made at a time when the United States was still firmly isolationist and a number of European countries were in appeasement mode, the film is bold, if a little clumsy, and in hindsight, more than a little problematic. Chaplin himself declared he would’ve never made the film if he had known the true atrocities of the Holocaust being perpetrated when he made it. That puts him in a better position than Roberto Benigni, whose comic stylings of the Holocaust in Life is Beautiful come with no such caveat. Still, The Great Dictator treads some uncomfortable territory with its juxtaposition of slapstick and references to concentration camps and ghettos. It’s also not a very effective satire. The film’s portrayal of Hitler stand-in Adenoid Hynkel, the dictator of Tomania, mostly relies on scenes of blustering speeches, given in a ridiculous faux-German dialect, peppered with “sauerkrauts” and “wienerschnitzels.” Is a snickering depiction of how silly German sounds really the most withering attack you can mount? That’s not to say The Great Dictator is without value. 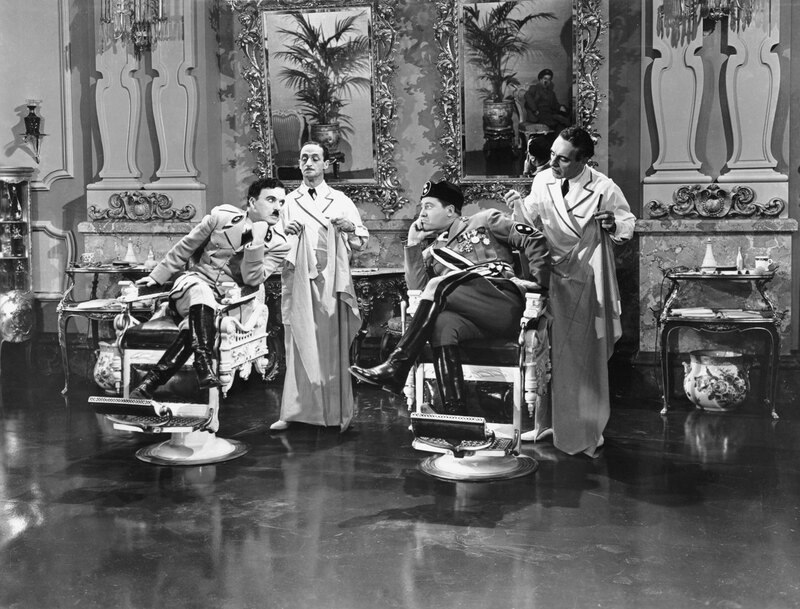 Chaplin is adept at playing both the vain, preening Hynkel and the poor Jewish barber living in the ghetto who bears a strong resemblance to him. While the scenes don’t reach the emotional heights of Modern Times, the barber’s romance with Hannah (Chaplin’s wife Paulette Goddard) is still quite charming, and there are a number of sequences that are downright delightful. It’s somewhat telling though that the film’s best set pieces — a dud shell from a cannon, an upside-down plane ride, Hynkel’s iconic globe dance, the one-upmanship antics between Hynkel and Mussolini cypher Napaloni (Jack Oakie) — would have been perfectly at home in a silent film, or are essentially silent here. Much of Chaplin’s artistry stands on its own without words. Of course, the element of sound makes possible the film’s famous ending — with Chaplin as barber decrying (though not explicitly) the values of Nazism. I’m of two minds about this approach, which lacks elegance, but is so clearly heartfelt, it almost makes up for it. The Great Dictator is not one of Chaplin’s finest efforts, but it is a fascinating historical document, with a massively popular film star taking head-on the leader of a country and political movement. Perhaps Chaplin wasn’t totally suited to the kind of vicious satire needed to make a film like this work, but the film is still kind of astonishing for what it does attempt. The Great Dictator is presented in 1080p high definition with an aspect ratio of 1.33:1. With its second Chaplin Blu-ray, Criterion has again produced a knockout, although this one’s maybe a shade less impressive than the Modern Times release. Still, the film looks fantastic, with excellent grayscale separation, image clarity and sharpness and lack of damage. Fine detail is present in every frame and the image possesses a subtle and intact grain structure. There is a little bit of flickering apparent in some shots, and an image instability that looks like noise in a few moments near the end of the film, but overall, this is a fantastic transfer. The uncompressed monaural audio track is fine, with a lack of any hissing, crackling or other distractions. Voices are clean and clear, but music can sound alternately tinny and harsh at points, which is certainly related to limitations of the source material. Criterion has assembled a great slate of extras here, combining some of those available on the previous DVD release with a host of new supplements. Kevin Brownlow and Michael Kloft’s excellent 2001 hour-long piece The Tramp and the Dictator explores the similarities between Chaplin and Hitler, who were born with days of each other and bore obvious physical likenesses. The documentary features interviews with a number of historians and filmmakers, and is a great inclusion. The disc features two new visual essays, one by Cecilia Cenciarelli on Chaplin’s planned Napoleon project, which he brought some ideas to The Great Dictator from, and one by Jeffrey Vance, which recounts the production history of the film. A new audio commentary by Dan Kamin and Hooman Mehran relates some of the same information. A really fascinating extra is 26 minutes of behind-the-scenes color footage shot by Chaplin’s half-brother Sydney. Some of this is seen in The Tramp and the Dictator, but there’s a lot more here, with different perspectives of a number of scenes. The footage is silent. Confirming the Chaplin brothers’ love of barbershop sequences are an excerpt from Sydney’s 1921 film King, Queen, Joker and an unused segment from Charlie’s 1919 film Sunnyside. There’s also a short piece that cuts together barbershop moments from King, Queen, Joker and The Great Dictator. The film’s rerelease trailer and a booklet containing an essay by critic Michael Wood, Chaplin’s defense of the film that appeared in The New York Times, a note from critic Richard Brody and a reprinted piece from Jean Narboni on the film’s final speech round out the package. Criterion continues their Chaplin releases with another top-notch entry. While the film has its share of problems in my opinion, it’s certainly worth seeing in this gorgeous presentation and with plenty of supplementary material to provide some different perspectives.